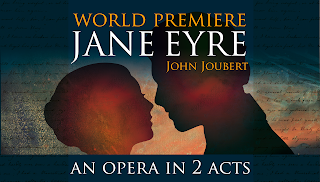 Kenneth Woods and the English Symphony Orchestra will be celebrating the 200th anniversary of Charlotte Brontë's birth in 2016 and the 90th birthday of composer John Joubert in 2017 with the world premiere of Joubert's opera Jane Eyre, based on Charlotte Brontë's novel. The performance takes place on 25 October 2016 at the Ruddock Performing Arts Centre in Birmingham. The cast includes Katherine Manley as Jane and David Stout as Rochester, with Clare McCaldin as Mrs Fairfax, and Mark Milhofer as Revd. St John Rivers. The performance is being recorded for release on the SOMM label. Jane Eyre is John Joubert's eighth and final opera which was completed in 1988. A number of Joubert's other operas have literary origins, and Joubert's engagement with the work of the Brontë sisters includes a song-cycle based on Emily's poems. The novels of the Brontë sisters seem to be a popular source of material for opera composers, Michael Berkeley's opera Jane Eyre was premiered by Music Theatre Wales in 2000, whilst Carlisle Floyd's 1958 opera on Wuthering Heights has just received its first recording (see my review) and film composer Bernard Hermann's Wuthering Heights was written in 1951 but had to wait until 2011 for a complete staged performance. Full details from the English Symphony Orchestra website.